Round 3! Today I am dreaming up ideas for our future Laundry Room. After doing laundry in a stacker shoved in an awkward closet for ten years, the idea of actually having a full size washer and dryer with some counter space to actually fold clothes on is literally mind blowing. While we aren’t planning a huge space, something large enough for my folding boards would be ideal. Btw, do you use folding boards?! They have been a game changer for us. These are my favorites. 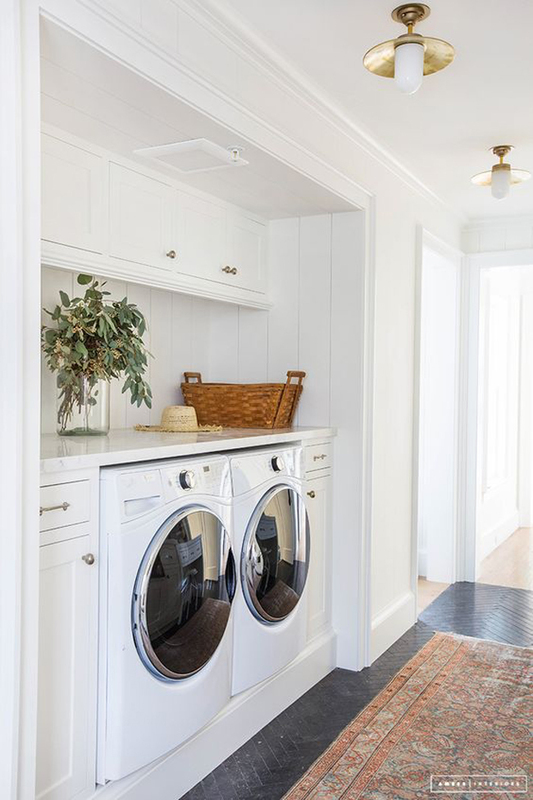 I would love something like the Laundry Room I designed for Electrolux (pictured above), but something a little smaller would be ideal for us. I am loving this layout with the large apron front sink in between. And bonus points, my architect loved this layout too… so hoping this is similar to the final plan. I haven’t decided yet whether or not a utility sink is a must, so I am also loving this tucked in nook as well. Those lights and tile aren’t too bad either! 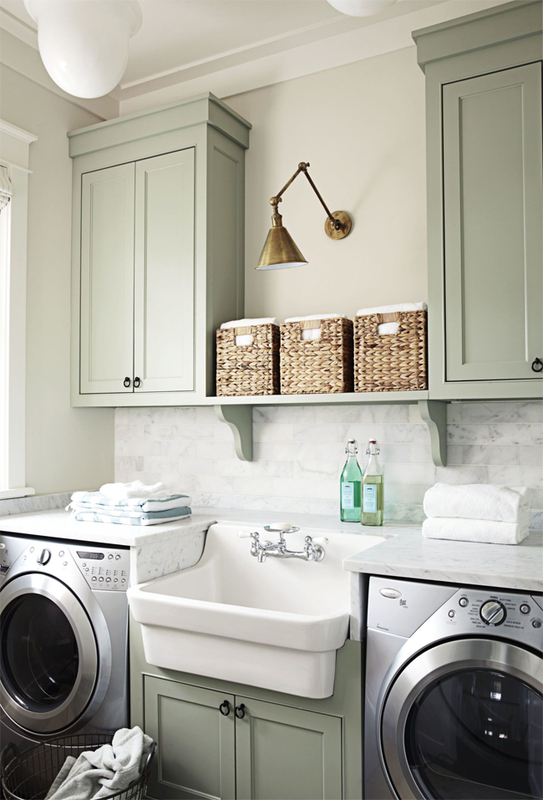 Is a sink a must for your laundry room?! I would love to know! I have dreamed of having a utility sink for years. We just bought a new house that has one in the laundry room and I love it. Having the washer and dryer separated makes it not as convenient to move a load of wet clothes over to the dryer. That is the setup that I have now and if I could change it I would put the washer and dryer right next to each other. Just a thought. Utility sinks are great for messier stuff like washing paint brushes out etc. and just come in handy in general in a laundry room. My vote is that it’s a must. A sink is a must so you can wash really gross stuff in it. I just washed my shark vacuum dust container which was had gotten a little wet inside and nasty. Yes! A great place to wash out brushes and rollers for those of us that redecorate often. All sorts of yucky washing can be done in a laundry sink. We even wash our dogs in ours, better than leaning over the bathtub. I think a laundry room sink just depends on your needs. I use ours for pre-treating stains, and for washing non-machine stuff like bathing suits, my husband’s baseball caps, and paint brushes. I didn’t have one in my last laundry room and didn’t know I needed it, now I’m really used to the convenience of it. I agree with not having the washer and dryer separated by a sink but having a sink is a must for me. A laundry sink is really awesome- especially for someone like you who does a fair bit of painting. I had one of those deep plastic sinks in our last house. It was a terrible sink. Paint totally stained it and I hated it. What’s crazy is that it was in beautiful cabinetry with a nice countertop- why? Why would a contractor do that? Anyhoo, I digress…In our current home, we renovated the laundry and put in a deep stainless sink. It is much better than the horrible plastic one and paint washes right out. As far as a sink between the washer and dryer, it is aesthetically pleasing, but it is totally impractical. You will hate moving around that sink to move laundry. Plus, I really like being able to fold clothes on top of my washer and dryer. With a tall husband, I need more than even the washer and dryer for the length of his pants. Having clothes hang in a sink between the washer and dryer while trying to fold just wouldn’t work. It sure is pretty though. ;-). Definitely go for the sink – but definitely put the washer and dryer together! I have to agree that a utility type sink near the laundry is ideal. However, in our last home our laundry room sat between a full bath & our kitchen. I soaked things in the tub & my kitchen sink doubled as my utility sink. Worked very well. However, our current home laundry is in a utility room with a utility sink nearby. Which is handy, since it’s the only decent sink option on that level. Soon we will be remodeling to accommodate MIL & laundry will be moving. W & D will be stacked. I’ve been looking @ those fancy jetted utility sinks that can handle delicates to put into the large half bath right next to new laundry. Love the aesthetics just as you do of the sink between units, but have to agree with others that I would hate it in practice. Our laundry room sink is the hardest working sink in the house. From washing large pots, soaking clothes, cleaning paint brushes, washing babies, and tossing wet beach towels until they get washed. 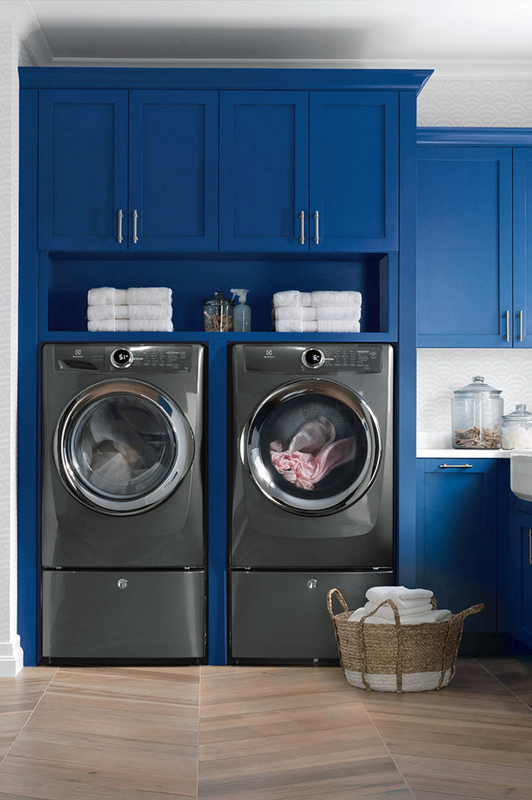 A laundry room without a sink is like a kitchen without a stove. It’s just not complete.